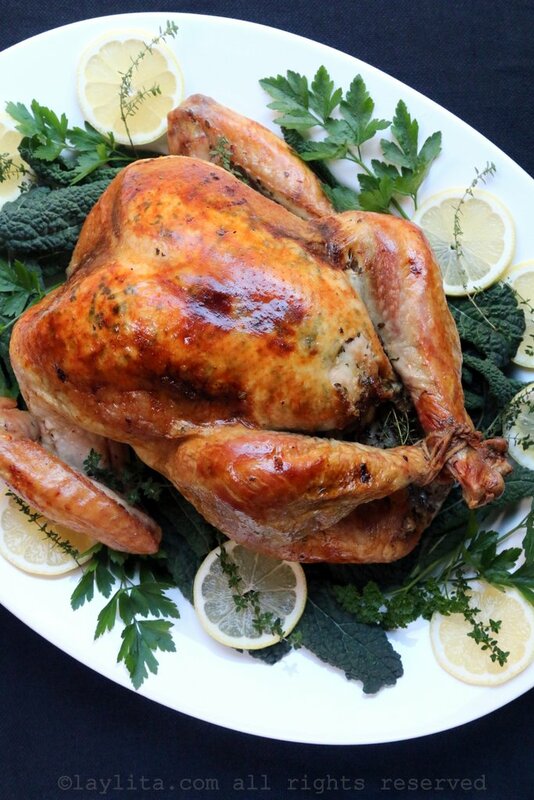 This easy recipe for lemon and thyme roasted turkey is made by rubbing a thyme lemon garlic butter inside the turkey skin, then slow roasting it, and using the pan juices to make a white wine gravy sauce. 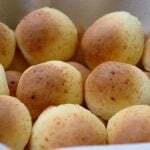 I’ve been exposed to many different ways of celebrating Thanksgiving: in Ecuador, it was usually a potluck style party attended by both locals and foreigners –American and many others. 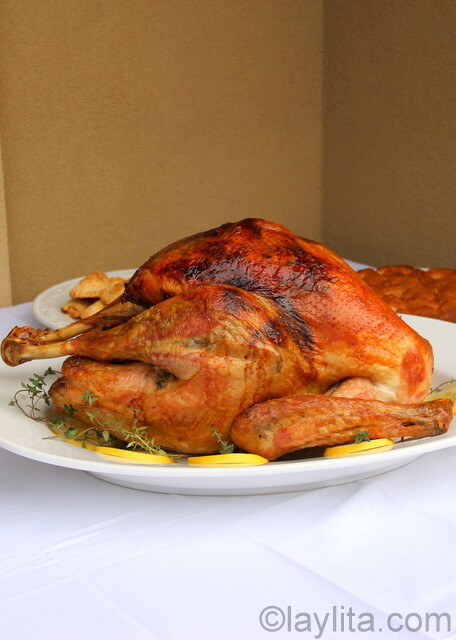 There was always a traditional roasted turkey, as well as a variety of other non-traditional thanksgiving dishes, all delicious. In Texas, it was a more traditional American thanksgiving lunch or dinner with family and all the must have sides: mashed potatoes, cranberry sauce, sweet potatoes and roasted marshmallows (my least favorite dish of all times), ham, my grandmother’s corn bread stuffing, jello fruit salad, pecan and pumpkin pie. In Seattle, it’s turned into a full circle back to potluck style Thanksgivings we had in Ecuador, this might be due to the fact that here we’ve made many close friends who are also modern day nomads, as we like to call ourselves, that are far away from family and find Thanksgiving to be a great occasion to get together and enjoy great food – from many different places. In the past years, I’ve enjoyed Thanksgiving meals that include Persian, Indian, Italian, French, Latin, Egyptian and American flavors; it is definitely something to be thankful for. 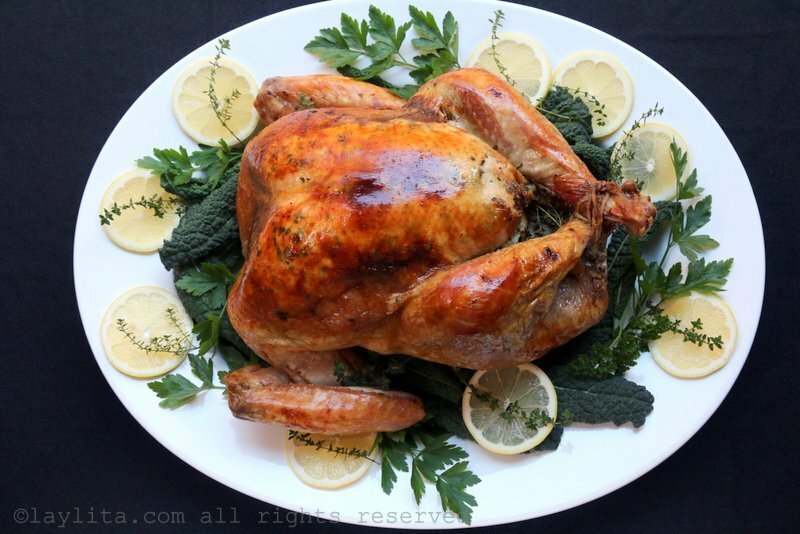 Easy recipe for lemon and thyme roasted turkey, baked with a thyme lemon garlic butter, and served with white wine gravy sauce. 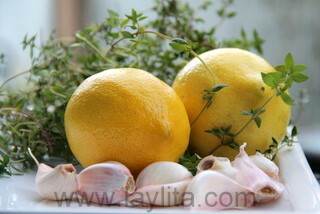 Mix the butter, thyme leaves, lemon juice, lemon zest, crushed garlic, and salt to taste. 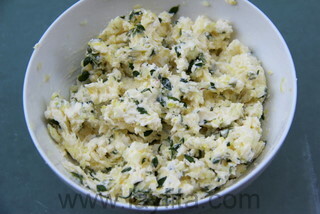 This can be made ahead of time, but bring it to room temperature to soften it before using. 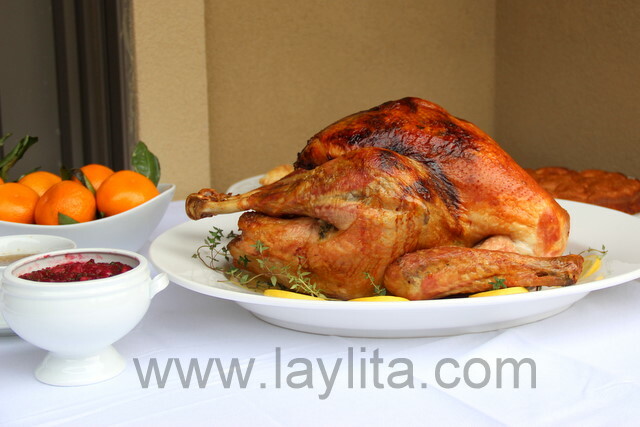 Remove the giblets from the turkey, and pat it dry (inside and out). 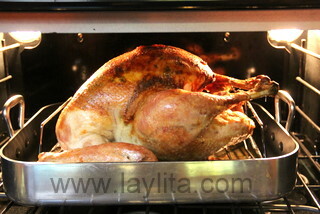 Pre-heat the oven to 325 F.
Rub the butter inside turkey cavities. 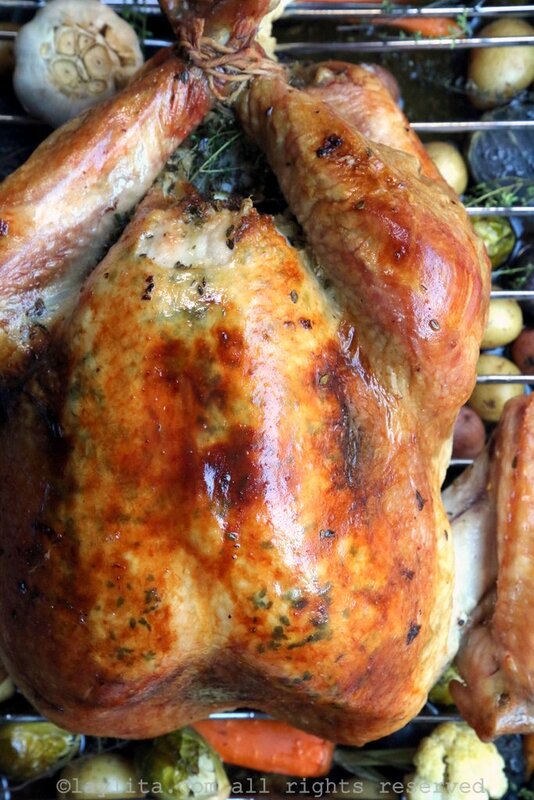 Use your hand to gently lift the skin on the turkey breasts, and then stuff it with the thyme lemon garlic butter. 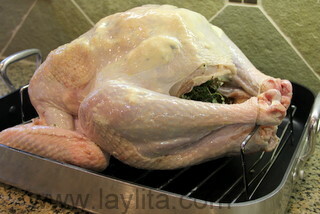 Place the additional thyme sprigs and lemon slices inside the turkey cavity. Rub the turkey skin with olive oil and salt, tuck the wings underneath the turkey and tie the drumsticks together using cooking twine. 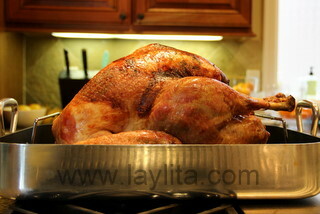 Put the turkey in a large baking pan on a roasting rack. 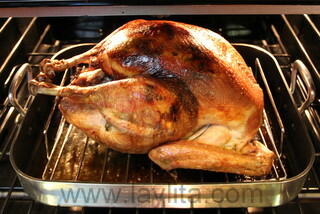 Place the turkey in the oven and bake at 325 temp for 2 ½ hours. 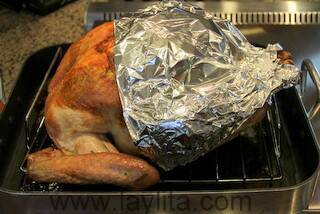 Check the turkey and cover the browned parts of the turkey with foil. 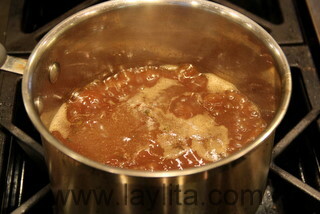 If making gravy, add the giblets to the bottom of the pan. Bake for 1 – 1 ½ hours more, check the turkey temperature by inserting a meat thermometer into the thigh– the minimum internal temperature should be 165 F. Keep in mind that the turkey will continue to cook even when you remove it from the oven and the internal temp can rise up to 10 degrees, so if you want the turkey meat to be perfectly done, then you should remove it from the oven at around 155 F -160 F.
Once you have removed the turkey from the oven, tilt the turkey so that the inside juices drain into the pan. 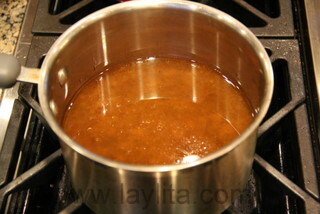 To make the gravy, remove the rack and the turkey from the pan. 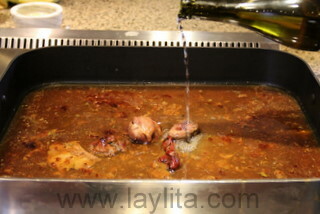 Pour the white wine into the pan and put it back into the oven for about 15-20 minutes. Then remove the pan from the oven, discard the giblets and any herbs that might have fallen into the pan, pour the sauce into a small sauce pan, and cook over medium high heat until the sauce thickens and reduces, about 20 minutes. 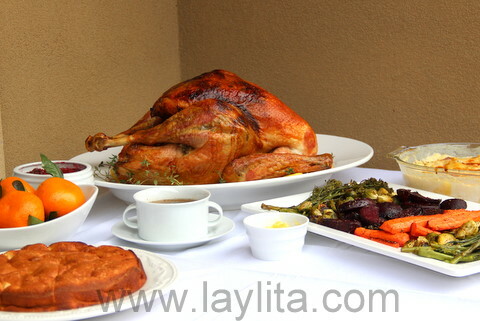 Carve the turkey and serve with your favorite side dishes. 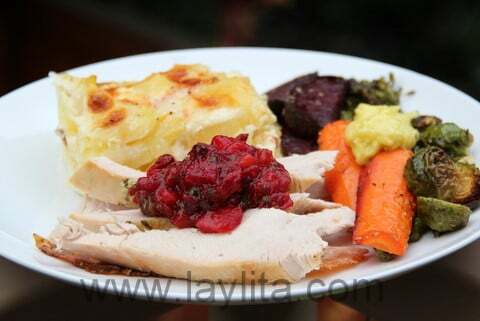 If desired you can also add assorted vegetables (potatoes, carrots, beets, etc) to the roasting pan – simply drizzle and rub them with olive oil, salt and thyme before adding them to the pan. 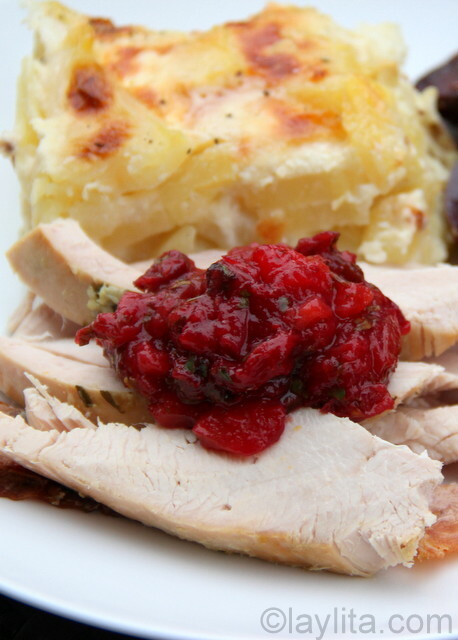 Smaller vegetables or cut in half/quarters work better since the turkey is slow roasted. 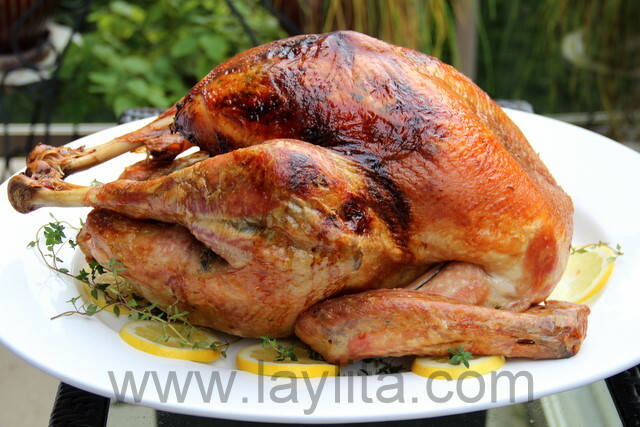 This is very simple and delicious recipe for roasted turkey, the thyme and the ridiculous amount of butter used in this recipe is a clear sign that there was some French inspiration in the preparation of this turkey. 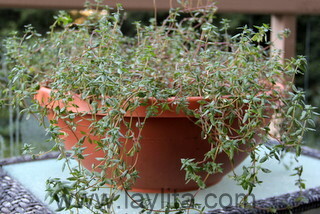 As a side note, you can easily replace the thyme with a different herb or mix of herbs – in case you can’t easily find thyme or if it just isn’t your cup of tead. 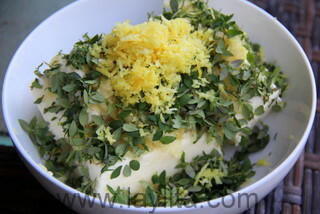 As I was making the thyme, lemon and garlic butter I couldn’t help but remember that my mom was also a big fan of making composed butters, though since she is also an amazing baker, most of her mixed butter was usually eaten with a warm piece of freshly baked bread. This butter is really good; I could probably just eat by the spoonful (I might have had a few tastes – it’s very addictive). You can also use it to make roasted chicken, herbed garlic bread, roasted vegetables, etc – it will infuse its deliciousness into anything you put in on. 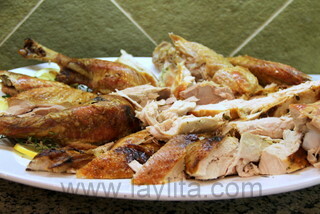 After the turkey was roasted, I used the pan juices and juices from inside the turkey to make a very easy and tasty gravy, I just added some white wine and reduced it until it thickens, the juices already have the great flavors from the turkey and the thyme butter, so it really doesn’t need anything else. 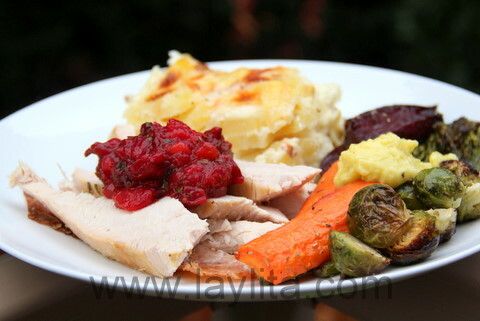 I served this lemon and thyme roasted turkey with a spicy cranberry mango sauce, potato gratin, and roasted fall vegetables with homemade aioli. 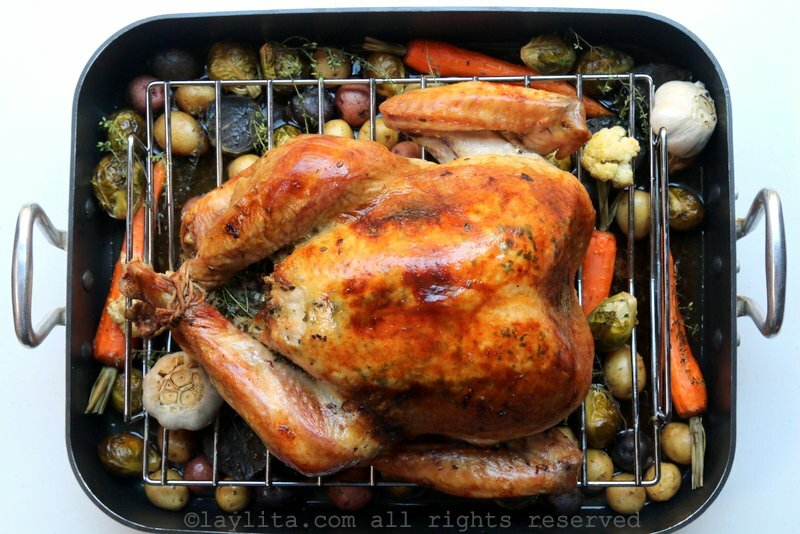 You can roast the vegetables separately or also add them to the roasting pan with the turkey. 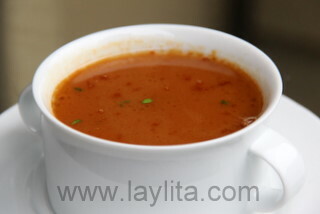 I also wanted to include sweet potato dish – for tradition – but one that didn’t contain marshmallows, so I prepared a sweet potato soup to serve as a starter. For dessert, I went on a pumpkin binge and made a couple different types of candied pumpkin empanadas, a candied pumpkin tart with honey crème fraiche and a pumpkin flan. Happy Thanksgiving! 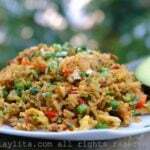 Thank you for sharing this wonderful recipe that I can’t wait to try. My only question for you is whether this recipe can be cut in half? i.e., using a 10 lb turkey and half all ingredients? Hi Karina – Yes, you can do that, I would recommend still using at least 2 sticks of butter, since more butter= more moisture for the turkey.